Lambchop’s Kurt Wagner hardly seems to touch a guitar these days. His last album, 2016’s FLOTUS, raised eyebrows with its enthusiastic embrace of voice-processing and a clear, if tangential, influence of hip-hop, principally Shabazz Palaces, but also Flying Lotus and Kendrick Lamar. Soulful, elegiac, full of emotion, it remained at its core, awkwardly and resolutely alt-country. In the interim, he’s had Dirty Projectors and Low snapping at his heels, welcoming ideas and technology first exploited in experimental hip-hop into their sound, and to arguably greater effect. This (is what I wanted to tell you) needed to go much further, and I’m glad to report that it does. Composed almost entirely on auto-tuner, then muted, fractured, and effaced, like a late period Richard Diebenkorn painting, it’s as if Wagner has brought his material as close to the condition of songness as is possible, but without quite letting it take form. This facility at slipping from country to electronica shouldn’t come as a surprise. Mid-noughties dalliances with X-Press 2 and with electronica duo Hands off Cuba, led to HoC’s Scott Martin and Ryan Norris becoming part of Lambchop’s ever-evolving line-up. That collaboration gave rise to Wagner, Martin and Norris releasing a straight-up slab of gut-level of synth-pop under the name HeCTA in 2015. 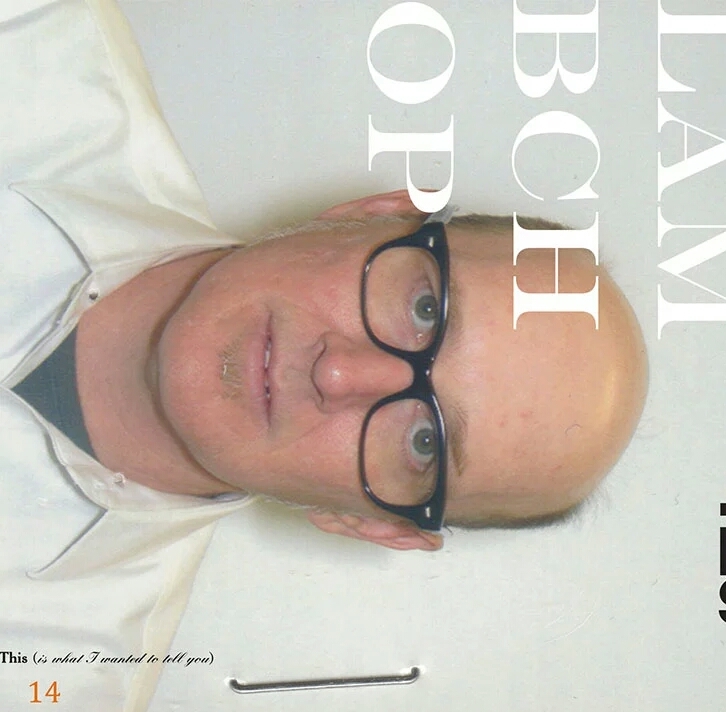 Listen back through Lambchop’s repertoire and you’ll find it’s often been there, but never quite found its full expression until now. It’s musically spare. Pianist Tony Crow adds fleeting, luminous touches around Matt Swanson’s laid-back bass guitar. They inhabit the negative space of tracks like ‘The air is heavy and I should be listening to you‘ and ‘Crosswords, or this is what it says about you‘, like a pair of langourous nudes in an old painting. Elsewhere, for instance, on the recent single ‘Everything for you‘, with its Charlotte Perkins Gilman inspired video, they sound like Erik Satie playing funk. They’ve been working with Wagner a long time and clearly know exactly what’s required. They’re joined by percussionist Matt McCaughan from Bon Iver, and legendary Nashville session musician Charlie McCoy, who has played harmonica with the likes of Johnny Cash and Bob Dylan. Again, everything they offer is unobtrusive, intimate, barely there, a complement to the haunting contortions of Wagner’s voice, one modulated vocal distortion layered upon another. The auto-tuner isn’t some kind of an afterthought. He really does use this thing as the basis of every moment of music on the record in a way that is consistent, thoughtful and endlessly fascinating to listen to. I mention Charlotte Perkins Gilman in connection with ‘Everything for you‘. In truth, I’ve no idea if her strange tale, The Yellow Wallpaper, served as the inspiration for any of this or not, but it seems apposite. A repressed, nameless, middle-class woman is confined to an attic room by her medic husband to recover from an unspecified nervous condition. She yearns for a life of action and intellect but is slowly driven mad for lack of stimulation and by the unearthly pattern on the wallpaper. The book is a classic of feminist writing and a key text in the canon of weird fiction. It’s impertinent to conjecture about an artist’s personal life, but it’s probably worth mentioning that Wagner’s wife was recently elected to the Chair of the Tennessee Democratic Party. This (is what I wanted to tell you), as far as it can be deciphered at all, is preoccupied with the moments of comedy and sadness, and concomitant triumph and absurdity, that punctuate a long-running marriage, with the attendant pressure, boredom and near constant distraction that comes from running a pair of closely linked lives in the public eye. It’s a theme that was explored in FLOTUS, but here, is put more elegantly. Every song except the closing ‘Flower‘ has the word You in its title, and the implication of This (is what I wanted to tell you) as an album title isn’t hard to work out, even if doesn’t easily give up its mysteries. Gilman’s yellow wallpaper torments her protagonist with its formlessness, its lack of structure, with the way its design seems to defy any possible method of fabrication. One imagines Wagner grappling with this music in a similar way. It has an identical, maddening disregard for obvious songwriting design principles and the same uncanny, unnatural sense of something warped beyond any state it ought rightly to be in. He also shares Gilman’s narrator’s addled, furtive tone, but with a ghostly quietness and sense of restraint that makes the listener feel as though they’re tiptoeing about in someone else’s house. He ditches the auto-tuner for the last song, and in his own fragile, finally unmediated voice, makes the forlorn proposition, “If I gave you a hundred dollars to record just three words / I could make the perfect song”. So many songs are about You, aren’t they? Yet the addressee so rarely gets the right of reply. That’s pop though, isn’t it? That’s the deal. You get all the best songs. ‘I will always love you‘, ‘Never gonna give you up‘, ‘I’ve been loving you too long‘, and let’s not forget, ‘You’re so vain’. Intimate discourse made into tacky theatre. The contingent and particular, transformed into the apparently universal. And we both know you’re big-headed enough that you probably do think this song is about you, don’t you? But it’s eaten you up, spat you out, and all this time, for all that it was worth, how can you even be sure that any of it was ever really meant for You? Meanwhile, Wagner’s protagonist, the literary creation we refer to as Kurt Wagner, reads the daily papers, visits a Mexican restaurant to watch the surfing on TV, waits for a mailman, comments on the weather forecast and how dark it’s getting and occupies himself with any number of passing, quotidian concerns, and tiny dramas, all the while meditating on the passing of time with a growing awareness that the world isn’t what it once was. “Let’s start again like stupid children / Sir, I’m afraid that’s not possible”, he murmurs on The new isn’t so you anymore. And the imagery is repetitive: trains, newspapers, weather, darkness, waiting. There’s a steady anxiety about something unnamable just out of sight. Some troubling thing gnawing at the edges of this cosy, fragile world. Something has departed. Something else is coming. I don’t give out tens lightly, and once vowed I never would, but I’m either finally on the appropriate medication, or This (is what I wanted to tell you) is as near to perfect as you’re ever going to get. Opaque as it is, it feels like a snapshot of life, and life as it is lived right now. Musically there’s not a moment here that isn’t complete and forward thinking, and the inquisitiveness with which Wagner explores this piece of kit that caught his attention at a Shabazz Palaces gig should be an object lesson in how to go about growing old. It’s an album aware of its meta-textual and political implications, without resorting to statements of the obvious. I’m about four days late with my review because I’ve been so mesmerised that any commentary I could possibly offer has seemed superfluous, and yet here I am now, almost unable to part with writing about it. Here’s ten stars from me that say, Kurt, mate, keep your hundred dollars, and don’t bother us with perfect songs. We like them well enough as they are.